I don't hear sound when I tap on a word or phrase for pronunciation. How can I fix this? Tap on any word in the dictionary lookup list, then tap on the speaker icon (top-right) to view Voice Settings. Turn off the switch labelled Use better-quality online voices when available. What are the difference between the free and paid versions of the dictionaries? The free versions are ad-supported and offer in-app purchases to extend the number of dictionary entries, phrases and verb conjugations. The paid versions include all in-app purchases at a discounted price. In addition, the paid versions include an online lookup feature for words not found in the device dictionary. How can I know which words are in the extended dictionary? If a box appears to the right of the search field, then words matching the search string are available in the extended dictionary. The number in the box indicates how many. Tapping the box will display a menu option to list the matching words. Do VidaLingua Dictionaries require an internet connection? All the information in the dictionary, phrasebook and verb conjugator is stored on the device and does not require an internet connection. Versions 6 and above include offline pronunciation as well. 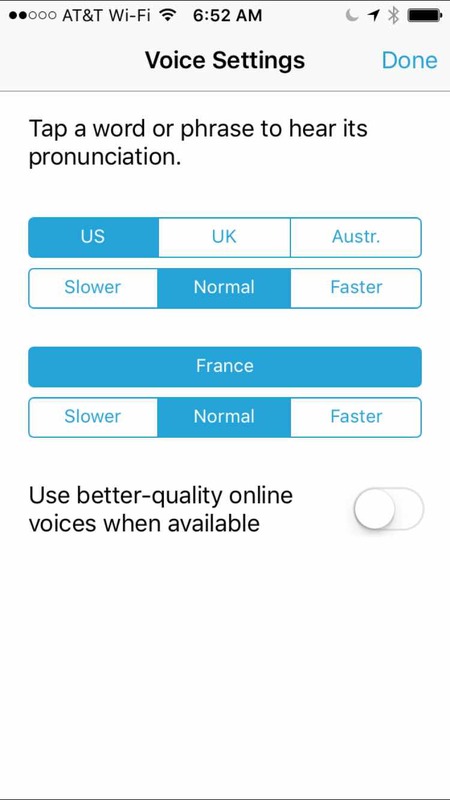 The only features that require internet are the phrase translator (German & Portuguese v6+), online lookup of dictionary entries not found in the dictionary (premium versions) and online pronunciation (optional, see speaker icon). How do I type characters with accents such as ñ, è or ü? To type accented characters, tap and hold the letter you want to add an accent to. A menu will pop up displaying the letter with a variety of accents. Slide your finger to your choice and let go. The accented character will be inserted into the word you are typing. What does it mean if an info icon appears in the search bar? 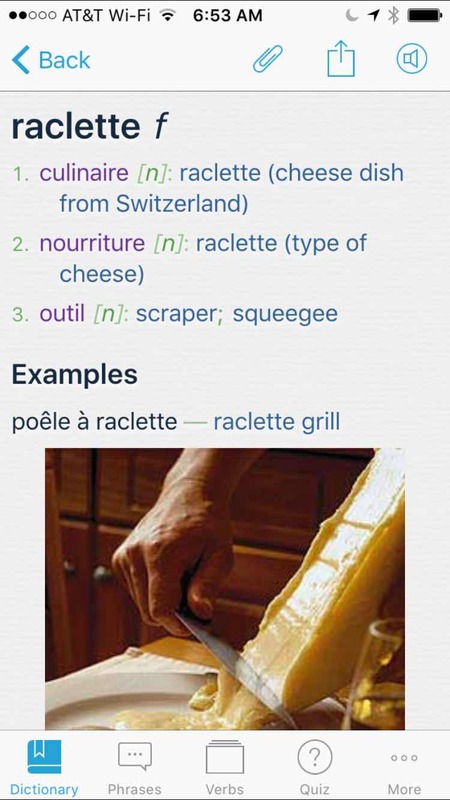 If you search for a word and there are matching entries in the paid versions of our dictionaries, an info icon will appear to right of the search bar. Tap on the info icon to display a window with the list of matching entries in the paid version. Our linguists are regularly adding words to the free and paid versions of our dictionaries. What can I do if a word isn't included in the dictionary? If you search for a word that isn't in the paid versions of our dictionary, an icon will appear to the right of the search bar. Tap on the icon to open the word in online dictionaries. Swipe left to open the word in Wiktionary and Wikipedia. We collect statistics on unsuccessful lookup attempts and use the information to add words to future versions of our dictionaries. How do I switch language direction to lookup words or verbs? There is no need to select a language to lookup a word or verb. VidaLingua uses a single database to store words from both language so lookups are fast and easy. What do dictionary abbreviations such as [m], [f] or [v] stand for? To cancel a trial or subscription, launch iOS Settings and select iTunes & App Store. Tap on your Apple ID > View Apple ID > Subscriptions. Select the trial or subscription then tap on Cancel Subscription. A more detailed explanation is available on Apple.com. Please note that Apple does not allow developers to access their billing system. VidaLingua cannot cancel a trial or subscription. How do I restore a subscription? Go to More > Premium Features screen, scroll to the bottom of the screen and tap on Restore previous purchases. If that doesn't work, try the following steps. Go to iOS Settings > iTunes & App Stores and tap on your Apple ID, logout and log back in with the same Apple ID you used to purchase the app. Uninstall the app, reboot your phone and and reinstall the app from the App Store. Why should teachers consider recommending VidaLingua language apps? Teachers should consider recommending VidaLingua language apps for the following reasons. VidaLingua multilingual dictionaries include essential language learning information such as noun gender, part of speech and verb conjugations. VidaLingua apps are available on all major mobile platforms including iPhone, iPad, Android, Windows Phone and BlackBerry. VidaLingua provides free, ad-supported version and more comprehensive paid versions. VidaLingua dictionaries engage students by allowing them to extend the dictionary and phrasebook with their own data. Can businesses buy VidaLingua apps for their members at a discount? Yes, businesses and other orgainzations can buy VidaLingua apps througth Apple's Volume Purchase Program. Why should I take the time to rate this app? Rating our apps favorably is a big motivator for our team. It helps to increase downloads which provides more resources to invest in updates. Rating apps for iOS is especially important because the App Store shows "No Ratings" for new versions until five reviews have been submitted. If you are considering an unfavorable rating, we would appreciate it if you would email us first to suggest improvements.